RJC Yacht Sales & Charter announces the sale of 107' Christensen KINGFISH! RJC Yacht Sales is pleased to announce the sale and closing of the 107' Christensen KINGFISH MY and has been renamed REFLECTIONS. 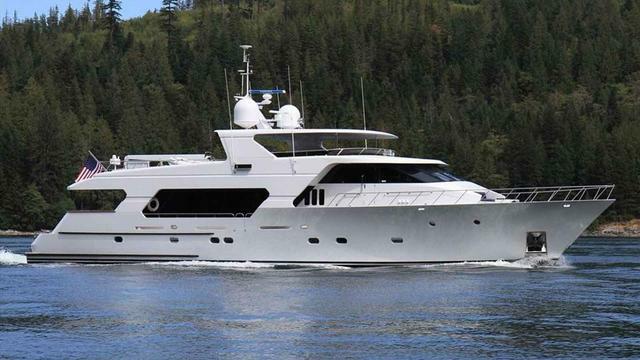 The buyer was introduced by Raymond Young at RJC Yachts. Built by US yard Christensen and delivered in 1997, she features naval architecture by Paragon Design and exterior styling by Ward Setzer. Her interior revolves around neutral tones using leathers, marble, leaded glass, mahogany, teak and burl woods. Accommodation is for eight guests in four cabins consisting of a master suite paneled in mahogany and padded white leather, two mirror image doubles with queen sized beds and a twin, all with entertainment centers and en suite bathroom facilities. The vast salon has a lounge area aft furnished with a love seat, armchairs, end tables, a games table for four, wet bar and an entertainment centre while forward, separated by a mahogany buffet, is a formal dining area seating eight guests. Further forward is the galley with a breakfast nook for informal snacks. Outdoors, the oversized aft deck has a settee seating six guests, a table and four directors’ chairs. Up on the flybridge there is more al fresco entertainment and dining available, as it offers a wet bar, gas barbecue, seating for eight guests, a six person hot tub, sun pads and tender storage. The very large teak swimming platform has access to the engine room and stairs up the starboard side to the aft deck. Twin 1,300hp Caterpillar diesel engines give her a range of 1,700 nautical miles. KINGFISH was asking $4,295,000 and, under her new name of RELEFCTIONS, is available for charter through RJC Yachts in Florida and the Bahamas.